There are stories that I was indoctrinated into the world of British comedy very early on in life. I remember lots of British humor, but none was as familiar to me as that of John Cleese–whether it be Monty Python, Fawlty Towers or A Fish Called Wanda. In fact, when I moved to college, Cleese’s Ministry of Silly Walks was one of the first posters I ever bought–and was up on my wall for longer than most. So, when publisher Three Rivers Press offered me the chance to read his autobiography, I snagged it as soon as possible. Notice: While I was given a free copy of the book in exchange for my honest review, my words and thoughts are my own. John Cleese details his humble beginnings, stealing away to a farm to avoid bombs as a child all the way through his successful career in show business. There are plenty asides. In fact, the entire book feels like a conversation amongst friends and it is quite hard not to picture Cleese’s distinct voice and tone delivering said stories of his life throughout the novel. I was surprised to learn that he had a lot of therapy as he grew up, but I wasn’t surprised to learn he was very tall, very early on. I enjoyed the bits of photos peppered throughout the book, as it allowed to see some exclusive memories and scenes that we may have not been able to see otherwise. 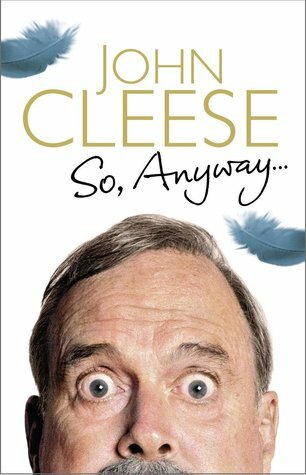 With some celebrity memoirs or autobiographies, it is hard to wonder whether the person is trying to state things and get them in paper to mitigate some argument, but with So, Anyway… Cleese’s character and honesty roll off the page, without further worry or consideration–his style doesn’t show malice or anything but honesty. And, of course, his legendary wit and character. I recommend this to Anglophiles, or to anyone who doesn’t have their head in the sand. You obviously have to have some form of knowledge when it comes to Cleese or his body of work, but I think anyone could enjoy it–provided they want to be entertained and won’t take things too seriously. So, Anyway… is available from your favorite retailer in ebook, and physical format.